The last day of spirit week in Ward Melville High school signals an important event – the annual pep rally. 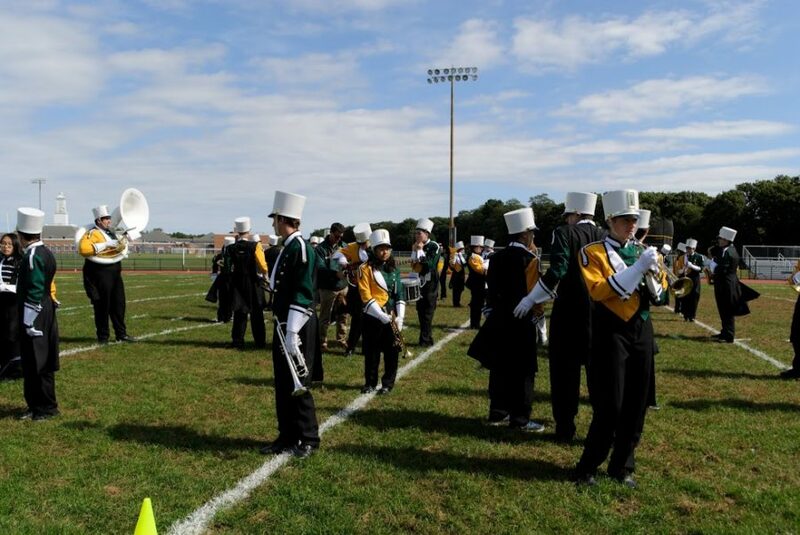 At the beginning of the seventh period, the members of the Ward Melville Patriot Marching Band make their way down to the band room to prepare to play at the event. Only half the band is present as the ninth graders do not participate in the pep rally. Feelings are mixed in the room. Some are excited, others nervous. Some are anticipating another streaker like last year. All the members of the band rush to get dressed in their uniforms and dapper hats as Mr. Hayes, the director of the marching band, urges them to pick up the pace. Before the start of the pep rally, the marching band practices on the field, attempting to play all of their music from memory. The sound of the band sounds quieter than normal as a large portion of the band is missing. At the start of the rally, the band plays “The Star Spangled Banner” and then continues on to their Billy Joel themed show. The band performs the songs, “We Didn’t Start the Fire/Piano Man,” “My Life/Only The Good Die Young,” and “Just the Way You Are.” The performance goes as expected. Afterward, the marching band leaves the field and enters the bleachers to play their pep tunes. On the bleachers, the marching band plays their music just as they would for any other game. The music is dragging and many of the students are on their phones trying to pass the time until they can leave. Then, as the band is playing “Take on Me,” a streaker runs from behind the bleachers, and onto the field and the students explode. The drum majors are confused. They are unsure whether or not to cut the band off so they just keep playing. As the band continues to play “Take on Me,” the streaker runs across the field while the students in the stands shout. Many members of the marching band are confused. After the crowd had calmed down a bit, the band continues to play their pep tunes, but voices continued to fill the stands talking about the event that just happened. Although the pep rally is meant to showcase the sports teams of Ward Melville, it ends up turning into another event focused on one person. However, impromptu events such as this appear to make the pep rally more interesting and exciting for many students of Ward Melville.